Comics are a valuable tool for getting children to read, and the comic strip is an ideal starting point for readers developing comprehension skills. Comic strip cartoonists present both textual and visual information in contained sequences, depicting clear courses of action across strips that follows a mostly regular rhythm with the occasional modulation. 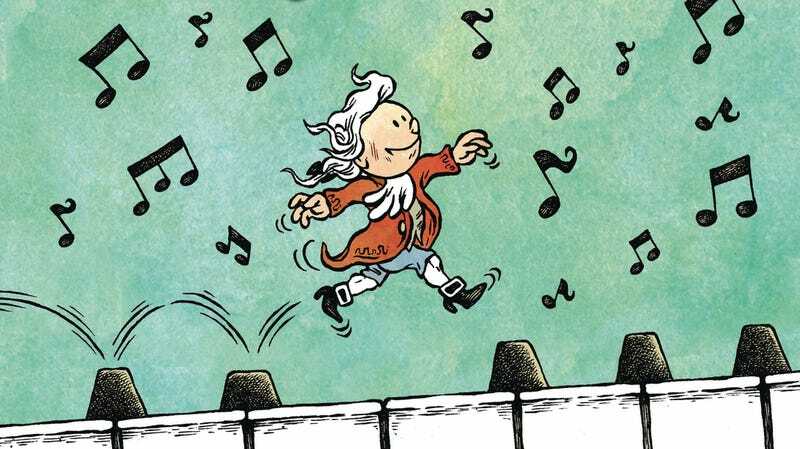 William Augel’s Young Mozart (Humanoids/BIG) imagines Wolfgang Amadeus Mozart as Wolferl, a precocious, playful, and lovably bratty boy in the vein of Dennis The Menace, Calvin, and Charlie Brown. 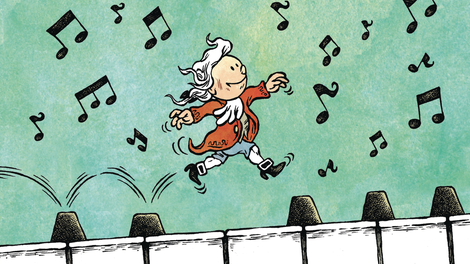 Young Mozart is one of the age 10+ books in Humanoids’ BIG imprint—the other age ranges are 6+ and YA—and it’s a charming book about artistic passion fueled by the boundless energy of youth. The comics marketplace for children and young adult readers is rapidly expanding as more and more publishers try to replicate the success of imprints like Macmillan’s First Second and Scholastic’s Graphix. After releasing a few titles under the HumanoidsKids umbrella, the international publisher has rebranded this imprint with a new name, BIG, to separate it from the usual Humanoids associations of adult-oriented fantasy and sci-fi. It’s part of an ongoing transformation for Humanoids, which includes other imprints like Life Drawn, specializing in down-to-earth, personal graphic novels, and H1, a superhero shared universe debuting this summer, spearheaded by Mark Waid and John Cassaday. The publisher is making smart changes to grow with the industry, and books like Young Mozart represent a significant step in Humanoids’ evolution. Young Mozart begins with Wolferl swept away in his creative momentum as he draws a minuet on a wall and fence, establishing at the start that this music is tied with movement. This idea is further amplified by the strip showing Wolferl play different instruments as he moves up and down a music scale, turning the composer into the notes. As sharp as the cartooning is in these pages, Augel knows what the kids really like: toilet humor. The musicality of farts comes into play, and Wolferl gets his own Snoopy with his dog, Pimberl, whose canine characteristics are more pronounced. Specifically pooping. There’s a comic strip and an illustration built around the idea of Pimberl’s turds as musical notes on a scale, and those base moments are the ones that will probably amuse kids the most. Published in an oversized hardcover, Young Mozart has the sturdiness you want from a children’s book. It comes with a short activity playbook with games and Mozart trivia, adding interactive and educational elements to give the book some extra value. Young Mozart is at its best when it focuses on Wolferl’s obsessive relationship with his music, which gets him into trouble as he endlessly composes wherever he is with whatever materials are available. The jokes in the dialogue are hit-or-miss, but the success rate with visual gags is much higher. Many of these involve visualizing how Wolferl creates, and Augel finds clever ways to use the comic strip format to make this process active and entertaining.